Published in association with the Institute for Visual Studies at James Madison University and the Harrisonburg-Rockingham Historical Society. An innovative exploration into the history of Harrisonburg, Virginia, and a new way to understand all American cities! Nominated for a 2017 Indie award. Gold Winner of the 2017 Regional Book of the Year as awarded by Foreword Indie Reviews, known as the Indie. Picturing Harrisonburg examines, as no previous book has, the history of Harrisonburg, Virginia, once a frontier town settled during the 1730s but now a burgeoning urban center centrally located in one of America's most beloved, historic, and beautiful regions—the Shenandoah Valley. The book offers a unique perspective on historical representation by focusing on how images of every kind reveal and represent a community's evolving ideals and aspirations that change over time. Organized chronologically around six distinct themes and periods of time and accompanied by 261 illustrations, many of them previously unpublished, Ehrenpreis and his contributing essayists explore the evolution of Harrisonburg's built environment, its iconic "places of memory," and how idealized visions of the community were often at odds with lived reality and the historical context in which the visions arose. The informative essays and captivating visual presentations begin in 1828 and include historic maps, sketches, lithographs, and plans, a pivotal 1867 panoramic oil painting of Harrisonburg, early-twentieth- century postcards, mid-twentieth- century documentary and commercial photographs, newspaper accounts and ads, images of "Urban Renewal," then/now photographs, and the graphic designs, logos, and conceptual plans pertaining to the twenty-first- century city. In so many ways, Harrisonburg's urban history resembles that of other American towns and cities. As David Ehrenpreis writes, "While Harrisonburg has a unique history and distinct character well-known to Virginians, the challenges and problems it has confronted over time are common and familiar regionally and nationwide. Thus, Picturing Harrisonburg offers a new approach for understanding the evolution of other American communities, towns, and cities through their respective iconographic histories." "Where we live is important. As a result, understanding the places where we live is a meaningful endeavor. 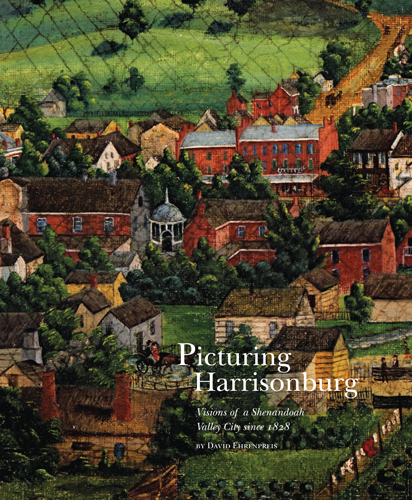 Picturing Harrisonburg takes a deep dive into the evolution of Harrisonburg, Virginia, and, in doing so, provides a rich case study for reading urban landscapes everywhere. The book presents a wealth of information with implications for how we envision, construct, and remember our communities. One of the key lessons is that Harrisonburg, like all cities and towns, is not an accident. The town developed into a major urban center through specific and willful human actions that, in this innovative book, are revealed in the visual representations of that place. "We are an adaptive species, and planning and designing our habitats are among our strongest tools for adaptation. The arts of planning and design advance through learning what has worked and what has not in the past. Picturing Harrisonburg reveals much about the evolution of an important Virginia city that provides insight into how we understand and care for all places."